After the luncheon, there was just enough time for me to run to Listening Library's ( Where the Mountain Meets the Moon audiobook makers!) 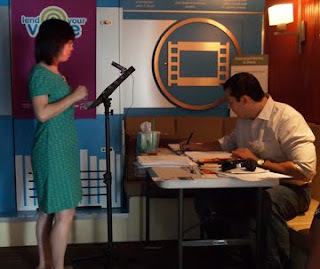 Lend your Voice mobile: This was a really neat event! 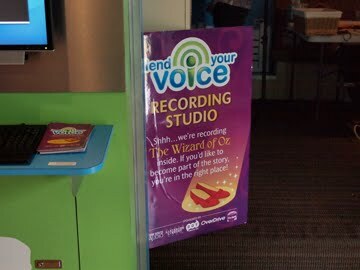 Listening Library was making a "crowd-sourced" audio book of The Wizard of Oz-- anyone interested in recording a section could come by to participate! Now, I have a little bit of a Wizard of Oz fixation. For any of you who have read The Year of the Dog, you'll know that the main character in the book wants to be Dorothy in the school play but has that dream destroyed when a friend says that Dorothy is not Chinese. Well, that really happened to me! So when I received the e-mail about the audiobook, I jumped at the chance to maybe make my Dorothy dream finally come true! Squee! My fifth grade dream fulfilled!